First Christian Church holds an emergency food pantry in the Fellowship Hall. 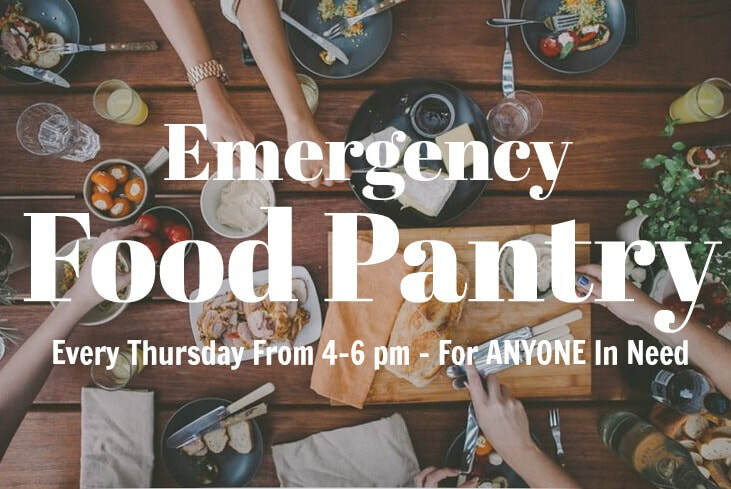 The emergency food pantry is available to anyone in need of food and simple necessities such as toilet paper, shampoo, or even books! All are welcome. The pantry is open from 4:00 - 6:00 PM every Thursday in the Fellowship Hall. The entrance is on Division Street. We ask for basic contact information and family size. No income verification required. Due to our limited resources, visitors are welcome to come once per calendar month. If you have food allergies, please let one of the volunteers know. We will try to accommodate your specific need. then your light shall rise in the darkness and your gloom be like the noonday." The number of people visiting the Emergency Food Pantry continues to grow. As we work to meet the need in our community for food while offering a place of caring fellowship, we are reminded of the importance of loving our neighbors through sharing the resources God has entrusted to us. Your continued support of our food pantry is received with thanksgiving. If you are interested in volunteering, contact Pastor Bryce or the church office. Donations can be placed in the food pantry wagon in the narthex on Sundays or brought by the church office. Cereal, pancake mix and syrup, canned vegetables, canned fruit, canned chicken, and canned tuna, pasta and pasta sauce, Helper meals, crackers, peanut butter and jelly, canned soup, ground beef, hot dogs, toiletries. Financial contributions are also welcomed. Thank you for your generous support of this outreach ministry.